Danny Dyer (TV’s Eastenders, The Football Factory) stars as Phillip, a horror and action film worker who falls in love with the mysterious, gorgeous Jane, a model who has just arrived in the UK from America. Philip becomes infatuated with this beautiful stranger, and Jane soon reciprocates his affections, but behind her glamour hides a dark and moving secret. Following a torrid night of passion, Philip is soon drawn into a nightmare more terrifying than any of the horror films he has worked on as Jane’s shocking past threatens to destroy them both. 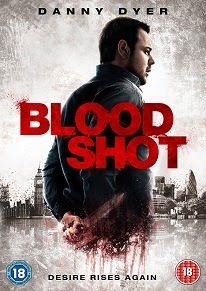 Written and directed by Raoul Girard, BLOODSHOT is a refreshingly direct, chilling thriller that underlines Dyer has more strings to his bow than the much-loved Mick Carter. Also starring Keith Allen (24 Hour Party People, TV’s Robin Hood) and featuring a striking performance from newcomer Zoe Grisedale as Jane, BLOODSHOT is the most surprising thriller you’ll see this year and the perfect Boxing Day antidote to all that familial bonding.